By burrowing in the bottom of lakes and redistributing nutrients, mayflies indirectly regulate phytoplankton and epibenthic primary production. Once burrowing to the bottom of the lake, mayfly nymphs begin to billow their respiratory gills. This motion creates current that carries food particles through the burrow and allows the nymph to filter feed. Other mayfly nymphs possess elaborate filter feeding mechanisms like that of the genus Isonychia. The nymph have forelegs that contain long bristle-like structures that have two rows of hairs. Interlocking hairs form the filter by which the insect traps food particles. The action of filter feeding has a small impact on water purification but an even larger impact on the convergence of small particulate matter into matter of a more complex form that goes on to benefit consumers later in the food chain. This local WCCO news segment from CBS Minnesota reports on the annual clean up. And from 2002: Swarms of Dying Mayflies Bring Good News. 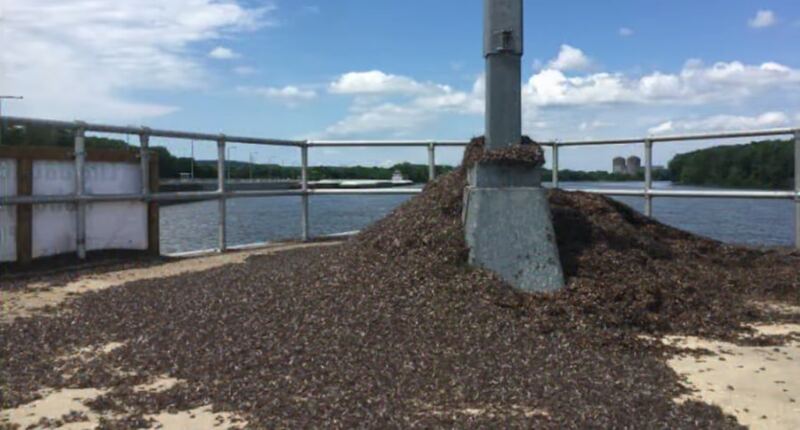 Watch more videos about swarms including a Swarm Of Locusts Devour Everything In Their Path and Australia’s budgie super swarms.